Andrew Spencer arrives in Scotland a week before his sister’s wedding and is immediately roped in to help. His job will be to assist the wedding photographer, Natalie Lockhart. However, she turns out to be the unforgettable one-night stand from six years earlier, the one who he connected with in a way he’s never connected with a woman before—both between the sheets and out of them. Unfortunately, she left before he woke up in the morning, never giving him so much as her name. He should be angry with her, he really should. And yet, the more time he spends with Natalie, the more he wishes he’d woken up in time to catch her six years ago. 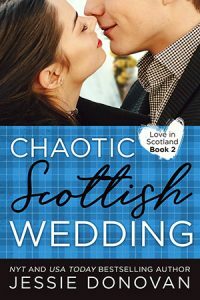 Since few women would put up with his family’s duels, one of the weirdest dinners in history, and even a wedding-related chocolate emergency, and not go running for the hills, Natalie Lockhart is one-of-a-kind. The added bonus: she sets his skin on fire unlike any other. The only question is whether love and laughter will be enough for them to overcome everything and find a way to be together. Of course, that means surviving the wedding and his family first before they can even think of the future. And given the track record of his family and their get-togethers, surviving without an arrest record isn’t always guaranteed.